Campaign Monitor Segments can be based on Salesforce data/custom fields. Campaign Monitor for Salesforce keeps custom fields up to date in Campaign Monitor, which in turn will update your segments. Campaign Monitor Segments Segments can be used with email Campaigns. Segments are based upon custom fields contained in your Campaign Monitor subscriber lists. So the first step to building a segment is to create one or more custom fields (depending on how much you want to segment upon). Both our import wizard or field mappings features allows you to quickly and easily create Campaign Monitor custom fields and map them Salesforce fields. 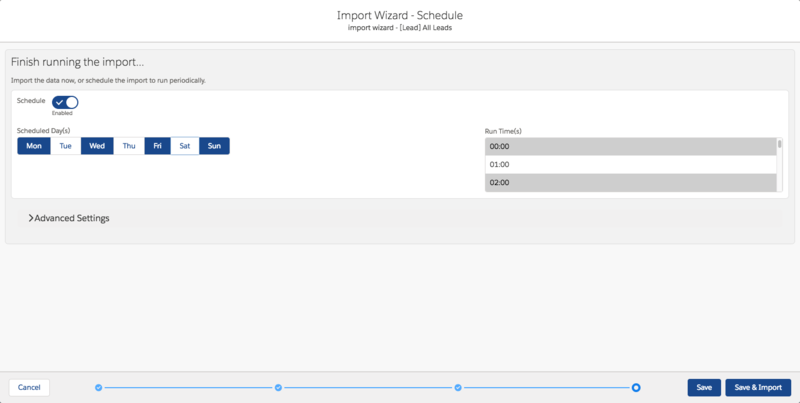 When you save field mappings or schedule an import via the wizard custom fields will be created in Campaign Monitor and they will be mapped to Salesforce. Once the fields have been added to your Campaign Monitor subscriber list you can build your segments. To do this either login to Campaign Monitor directly or click on the Campaign Monitor tab in Salesforce. Once in Campaign Monitor follow these instructions to create your segments. As mentioned above there are two ways to create custom fields and map data using our integration, more details on both below. This import wizard allows you to add Salesforce records to Campaign Monitor. You can also create and map custom fields. You can schedule the import to run every hour of every day which will add records and update custom field values. Using any of the four methods above will, be default, only send over a Lead or Contact email and the name field. If you want to include additional information which can then be used with Campaign Monitor segments, you can map further fields using custom field mappings. Custom field mappings work independently to the field mappings in the Import Wizard. This is because custom field mappings can only map fields that have a direct link to the Lead or Contact object, whereas the Import Wizard can use any fields in Salesforce, as long as it contains an email (this could even be a custom email address field - e.g. on a custom Opportunity object).